This study is looking at: (i) the support available to you and your family; (ii) experience of relationships; and (iii) places you find supportive/unsupportive while living with fibromyalgia, or supporting a family member with fibromyalgia. To take part, you must have been/or know a family member who has been diagnosed with fibromyalgia, and have other family members willing to take part who are aged 10 or older. The research involves an interview where you would be able to map out relationships and places that are supportive and unsupportive, then provide a written account on one good and one bad memory of support, and then have another interview about the written account. Unfortunately due to limited funds, the researcher is unable to reimburse participants. However, she does not expect participants to travel and she will aim to travel to them. 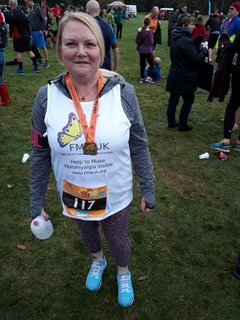 John Speirs is running a series of marathons and runs to support FMA UK work and to raise awareness of fibromyalgia because his wife, Lynn, lives with fibromyalgia. We have already written about John’s challenges and here is an update from John after he has run a few more runs. John: ‘’ The Strathclyde Park Half Marathon event went really well.... I finished 4th! I completed in 99 minutes on a very slippery and cold course and set a personal record of 5k of 19.39 minutes also I’m chuffed!’’. 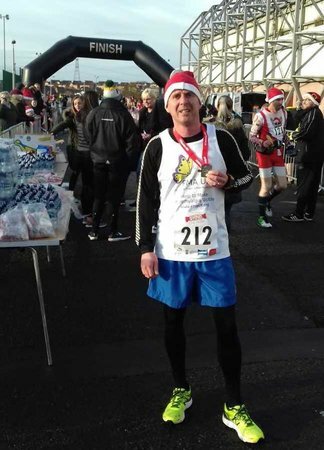 John has also run the Cumbernauld Santa run 5k. In January he will start a proper marathon training for Edinburgh Marathon taking place in May 2018. John told us: ‘’So I’ve decided to run a marathon at the grand old age of 42. Why? Very simple, to help raise awareness of Fibromyalgia and hopefully raise some much needed money. My wife Lynn was diagnosed with Fibromyalgia about 6 years ago. Since then she has got progressively worse and she is now in constant pain. 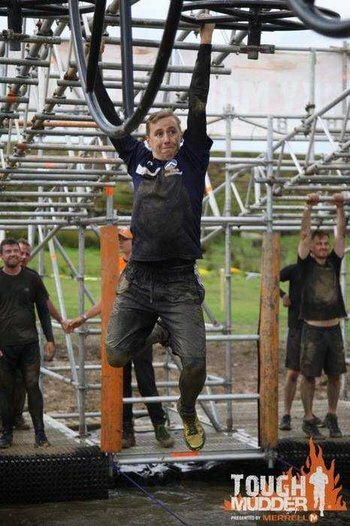 Chris Murray is doing a series of tough mudders challenges for his Mum. Chris told us: ''My name is Chris, I am 29 and currently live in Halifax, West Yorkshire and I’ve decided to run 19 Tough Mudder events over a space of 5 months, some with back to back days and with only 5 days recovery time between events. Why? Because back in 2004, at the age of 16, whilst going through my GCSE’s, living at home with a brilliantly loving mother who raised three children single handed whilst working a full time job, she became sick. My mum, Jackie, was forever active, when she was back from work she was playing with my little brother, at weekends a lot of her time was spent in the garden, out shopping or doing some form of DIY in the house, but that all changed. She became lethargic, was feeling pain when moving and was struggling to walk down the road on her bad days. Naturally, she went to the doctors for a check-up, they ran many tests, and couldn’t find a physical or biological reason for the deterioration she was going through, one doctor suggested that it was a psychological condition. As time passed she deteriorated and had to leave a job that she loved, but it was a hard task to help get my brother ready for school, let alone travel by bus to work. 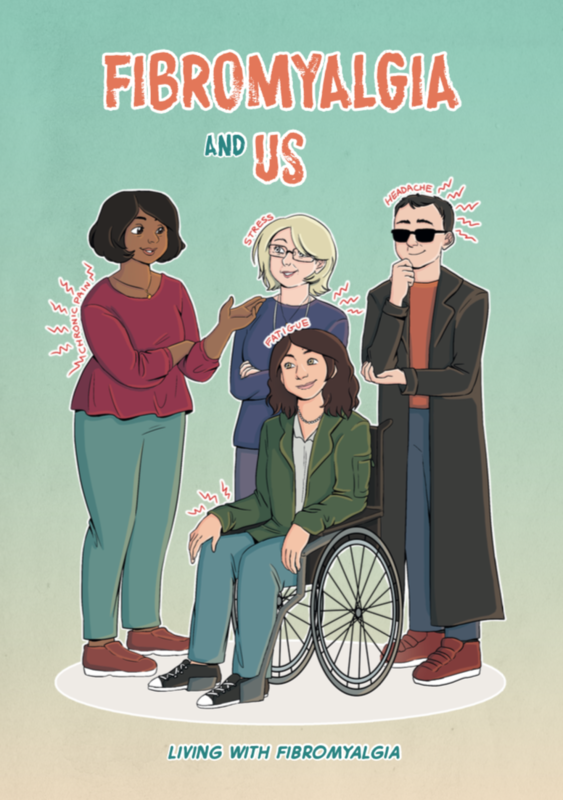 A team of individuals from the University of Dundee, including people with fibromyalgia, have designed a comic with the purpose of raising awareness of fibromyalgia amongst professionals, families, and other communities. It illustrates the ongoing life transitions of those who have fibromyalgia, as well as its impact on friends and family. It also highlights the importance of a strong support network to enable people to adapt to the multiple transitions triggered by fibromyalgia and flourish despite its substantial challenging consequences. Please click here to have a read!